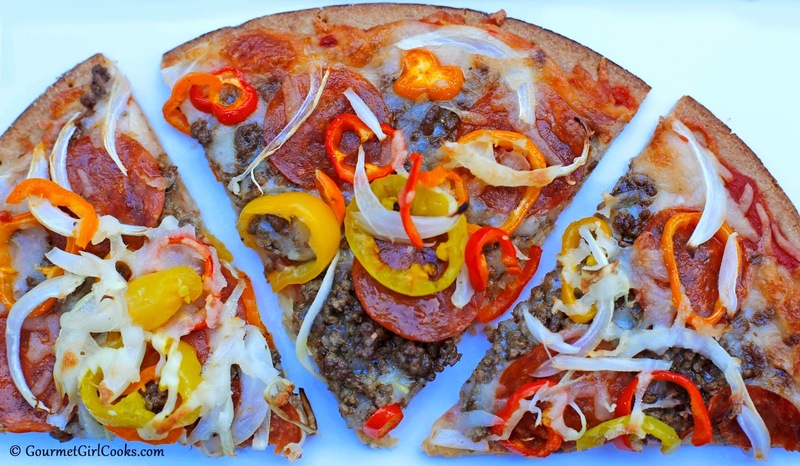 This evening we enjoyed pizza topped with cooked spicy ground beef (seasoned with black pepper, sea salt, cayenne, pinch of sage, pinch of fennel seeds, and granulated onion), mini red, yellow and orange peppers, Vidalia onions and pepperoni (as well as pizza sauce and mozzarella). I rolled the crust out thinly between 2 sheets of parchment paper. It turned out delicious. For the pizza crust recipe, click here: Herbed Pizza Crust. Enjoy!